The Newport Mechanics Institute was founded in 1825 located in Pyle Street, at the western side of what was then Cockram's Yard. .. The first meeting for the formation of the Society was held in February the plan on being proposed was zealously adopted and promptly carried into effect. Since the period above mentioned, a very commodious room has been taken and fitted up an excellent collection of instructive and amusing books formed (chiefly by donations), and a society consisting of nearly two hundred members organised under the direction of a President, two Vice-Presidents, Treasurer, two Secretaries and a Committee. The Library is open every evening (Sundays excepted) from seven till ten o clock, for the purposes of reading, exchanging books, &c. and a member of the Committee attends every evening to superintend the business of the Library. Abraham Clarke was a Unitarian philanthropist who was curator to the Isle of Wight Philosophical Society and was the force behind the creation of the Institute. "NEWPORT ATHENAEUM AND MECHANIC'S INSTITUTION, in Pyle street was founded in 1825, and has now a good Library of more than 1200 volumes, a well supplied news-rooms, and occasional lectures. R.M.Wavell, Esq., is the president; Messrs. C. Urry and C.Allee, secretaries; G Rochfort, librarian." However, by 1861 annual meeting things had deteriorated with the IW Observer reporting "Something must be done, or we are pretty sure that this old society will be shortly numbered with the things that are past." 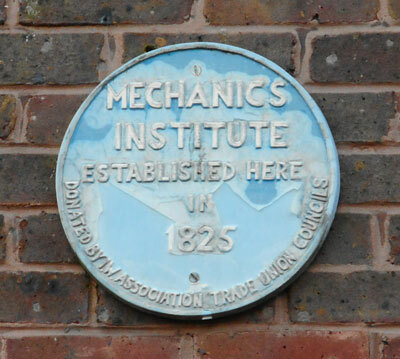 "We regret to state that our once flourishing Mechanics' Institute ceased to exist on Monday last, having perished for want of support in its thirty-eight year. The neglect and apathy of the working classes for whose benefit it was originally established, caused it to decay rapidly during the last few years, and having become insolvent, its valuable library of 1300 volumes of books, &c., are to be sold by auction on Thursday evening, for the benefit of creditors." 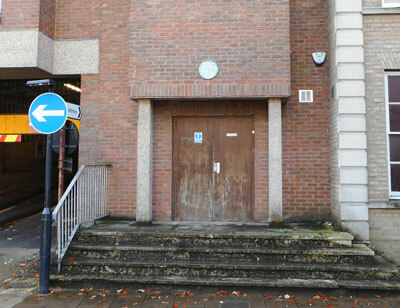 The old building was demolished in 1978 and the site developed as part of the Supermarket and multi-storey car park. The plaque was erected in 2000 by the IW branch of the TUC.